Vaughan Williams is here well served by a German conductor and orchestra, working with an Austrian cellist and record company. Karl-Heinz Steffens (b. 1961), formerly principal clarinet of the Bavarian Radio Symphony Orchestra and the Berlin Philharmonic, is about to conclude a nine-year stint as chief conductor of the State Philharmonic Orchestra of the Rhineland-Palatinate, based in Mainz and the Rhein-Neckar-Triangle, and has been busily recording with them a series of single-disc composer portraits under the heading “Modern Times”. Previous issues have focused on Bernd Alois Zimmermann, Dallapiccola (review), Dutilleux (review), Ginastera, Szymanowski (review) and Antheil (review); so Vaughan Williams is the seventh composer – and England the seventh country – they have surveyed. The disc’s value is to be found not least in its imaginative and innovative choice of repertoire. Three phases of Vaughan Williams’s long career are exemplified: his early period (the first version of the Bucolic Suite dates from 1900 and that of In the Fen Country from 1904), the 1920s (the Fantasia on Sussex Folk Tunes was written in 1924/5 and the opera The Poisoned Kiss between 1927 and 1929), and his Indian Summer in the 1950s (the – aside from its music – eminently forgettable documentary the England of Elizabeth was first screened in 1957). Moreover, only In the Fen Country could be described as anything approaching a staple of the record catalogues. 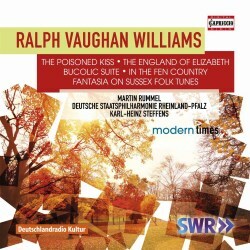 Michael Herman’s admirable Vaughan Williams discography lists only three other versions of the England of Elizabeth portraits (André Previn, Andrew Penny and Rumon Gamba – who includes more music than does Steffens), two of the Poisoned Kiss overture (George Hurst and Richard Hickox), and only one each of the Bucolic Suite (Martin Yates) and the Sussex Fantasia (Julian Lloyd Webber with Vernon Handley). It follows, I suppose, that the last two works named are likely to be of the greatest interest to many collectors – especially perhaps the Bucolic Suite, which was only edited for performance, by Julian Rushton, as recently as 2011. It is a fine piece, superbly orchestrated. Beginning with the sounds of rural fiddlers tuning up, it features two lively if somewhat episodic allegros (conducted at times a bit stiffly by Steffens) framing a gorgeous andante (containing, as Christian Heindl’s programme note astutely observes, some slightly surprising echoes of Dvořák) and a rather more profound intermezzo, which seems at times to point forward to the more ‘mystical’ side of Vaughan Williams’s later musical persona. The Fantasia on Sussex Folk Tunes for Cello and Orchestra, meanwhile, was dedicated to and first performed by no less a figure than Pablo Casals, who apparently shared with the composer himself a number of reservations about the work. At this remove, it is hard to guess what these might have been. I suppose it lacks the melodic memorability and sense of atmospheric spirituality we associate with absolutely top-notch Vaughan Williams, and at twelve minutes it’s not the easiest concertante work to programme; but it is a lovely piece with no very obvious weaknesses. The full-toned and eloquent soloist Martin Rummel does it full justice here, and participates in a well-integrated partnership with Steffens and his orchestra. Indeed, all the performances on the disc are good, as is Capriccio’s full-bodied sound. Not that any of Steffens’s readings is necessarily a first choice: comparisons with certain recordings I happen to know, for example, already suggest that he doesn’t quite have the élan of Hurst’s Poisoned Kiss, the swashbuckling extroversion – where appropriate – of Previn’s England of Elizabeth, or the wonderful fluidity of Haitink’s In the Fen Country. But he is consistently committed, eloquent and – some slightly heavy-handed articulation apart – commendably idiomatic; and his orchestra is excellent. Overall, then, this is a highly appealing disc. It works well as a sequence, and is well suited for use both as a Vaughan Williams primer and as a potential gap-filler for a collector who already knows, say, the symphonies, the Tallis Fantasia, Dives and Lazarus and some of the concertos. Above all it conveys, in sometimes miniature form, many of the hallmarks of Vaughan Williams’s greatness: his creative rootedness in English folk music, the individuality of his own voice, his melodic gifts and, not least, his superlative command of orchestral colour. Warmly welcomed and recommended.